Agios Pavlos beach (i.e. Saint Paul) is a heaven of seclusion, located 3km east of Agia Roumeli and 6km west of Loutro, at the exit of the Eligia gorge. The beach is long with grey sand and pebbles, surrounded by a pine forest. The azzure waters are deep and affected by the southern winds. Agios Pavlos is a divine place which deserves both your attention and above all your protection! Nearest accommodation can be found in Agia Roumeli whereas food and drink at one restaurant near Agia Roumeli. There are no pine trees on the beach, so an umbrella might be necessary. 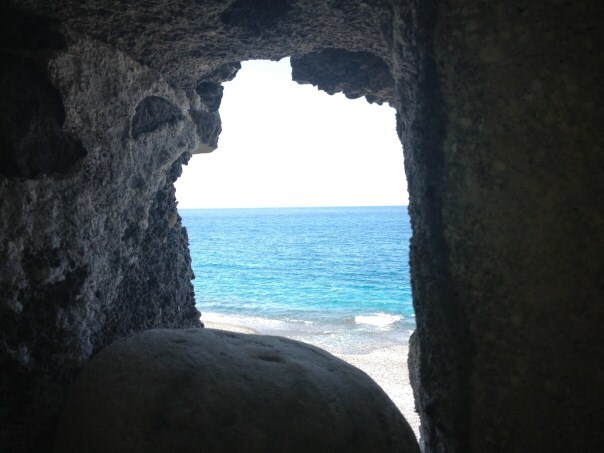 Agios Pavlos is named after the small Byzantine church on its coast, which was built right on the spot where Saint Paul baptized people while on his way to Rome. Access from Chania is possible only by rented or private cars and motorbikes until Loutro, and then on foot. The closest harbours are Agia Roumeli and Loutro. Access from Agia Roumeli is possible either by private boat or on foot (1-2 hours), on an easy path that runs beside the sea. Access from Loutro is possible either by private boat or on foot (about 4 hours).